World's largest 3D-printed bridge in Shanghai, China. Small items like toys and shoes aren't the only things 3D printers can make. As a team of architects from China's Tsinghua University School of Architecture recently demonstrated, the machines can be used to print sturdy bridges large enough to span waterways. 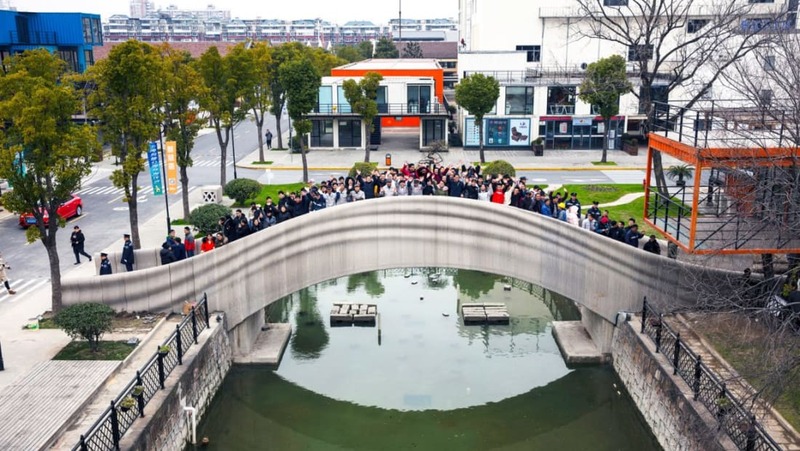 As dezeen reports, at 86 feet in length, the new pedestrian bridge on a canal in Shanghai's Baoshan District is the longest 3D-printed bridge on Earth. Designed by the university's Zoina Land Joint Research Center for Digital Architecture (JCDA) and constructed by Shanghai Wisdom Bay Investment Management Company, it consists of 176 concrete units. The parts were printed from two robotic-arm 3D-printing systems over 19 days. The 3D-printing technology cut down on costs as well as construction time. According to Tsinghua University, the project cost just two-thirds of what it would have using conventional materials and engineering methods. Even though their approach was futuristic, the architecture team paid homage to a much older bridge in a different part of the country. The new bridge's arched structure is inspired by that of the 1400-year-old Anji Bridge in Zhaoxian, the oldest standing bridge in China (and the world's oldest open-spandrel arch bridge). The bridge in Shanghai may be the longest 3D-printed bridge in the world, but it isn't the first. Last year, a 3D-printed steel bridge was unveiled in Amsterdam. Thanks to current events, Victor Hugo's 188-year-old book The Hunchback of Notre-Dame has ascended the bestseller list in France. The novel follows a hunchback named Quasimodo who is living in the cathedral's bell tower in Paris during the 15th century. 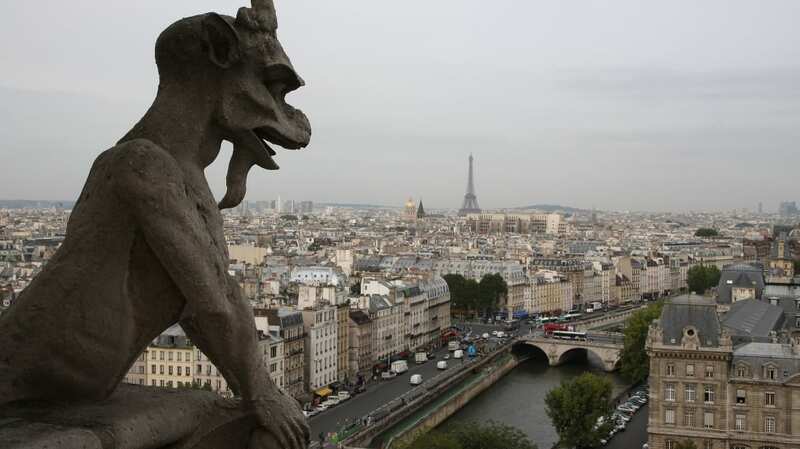 Now, following the fire that destroyed parts of Notre-Dame on Monday, April 15, readers in France are rushing to buy a copy, The Guardian reports. Investigators aren't sure how the Notre-Dame fire started, but they suspect it resulted from an accident rather than arson or terrorism. The blaze consumed the structure's 800-year-old roof and iconic spire but left the stone facade, bell towers, and south rose window intact. France is already planning to rebuild the church, and so far $1 billion has been raised for the cause. The Notre-Dame cathedral may not have become the beloved landmark it is today if wasn't for Victor Hugo. The Hunchback of Notre-Dame came out at a time when the cathedral was in disrepair, and by writing his book, Hugo hoped to revive interest in the historic piece of architecture. He did just that: In reaction to the novel's success, Notre-Dame underwent a massive restoration that lasted a quarter of a century. Many new elements were added, including that spire that was lost on Monday. This week, the French people are returning to the book that's tied so deeply to Notre-Dame's reputation. On April 17, different editions of The Hunchback of Notre-Dame occupied the first, third, fifth, seventh, and eighth positions of the bestseller list of Amazon France. A book detailing the history of the Gothic cathedral claimed the sixth slot.